UO researchers on the forefront of quantum information science continue to make major strides toward passing legislation, and last week three of them were awarded a major grant to pursue studies in quantum science. Quantum technology uses quantum physics principles and advanced engineering to solve real-world issues. It requires manipulating the smallest possible units of energy and matter. It is already in limited use, but is expected to take off in the coming years as scientists around the world compete to leverage the promise of quantum technology. The U.S. has been put on notice by the U.K., European Union and China, which in the past few years have invested or committed an estimated $420 million, $1 billion and $10 billion, respectively, for quantum technology development. 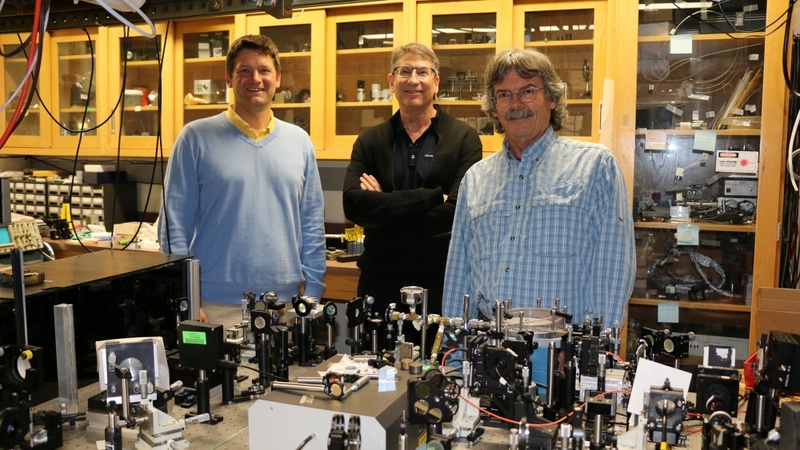 The three UO researchers will seek to use “quantum-entangled” states of light to enhance the sensing of remote objects and to probe the structure and behavior of molecules. Remote sensing can be used to determine how far away and how fast a distant object is moving, while quantum-enhanced spectroscopy can answer questions such as how are molecules arranged and how they pass energy from one to the other in processes such as photosynthesis. The NSF award announcements were coordinated with a Sept. 24 summit on quantum information science convened by the White House Office of Science and Technology Policy. It included leaders from federal agencies, higher education and industry to discuss how to accelerate progress in quantum information science. The White House also released a “National Strategic Overview for Quantum Information Science” that outlines a plan for advancing the field. David Conover, UO’s vice president for research and innovation, and UO physicist and Nobel laureate David Wineland attended the summit, where they helped make the case for federally funded research in quantum information science. Raymer and University of Maryland physicist Christopher Monroe co-authored the original proposals for a National Quantum Initiative that became the basis for federal legislation introduced in June. The National Quantum Initiative Act would establish a comprehensive national program to accelerate research and technology development in this emerging area. Its goals are to advance the country’s economy and national security by securing the U.S.’s role as the global leader in quantum information science. Following the White House summit, a Senate Energy and Natural Resources Committee hearing held the next day reviewed the Department of Energy’s role in quantum science and made clear that the legislative push to launch a National Quantum Initiative is continuing to gain momentum. Earlier this month, the National Quantum Initiative Act, House Res. 6227, passed the House without objection. The bipartisan bill is cosponsored by Chairman Lamar Smith, a Texas Republican, and ranking member Eddie Bernice Johnson, a Texas Democrat. On Sept. 28, the U.S. Department of Commerce’s National Institute of Standards and Technology announced it had signed a cooperative research and development agreement with the nonprofit SRI International to lead a consortium focused on quantum science and engineering. At the White House Summit, Smith said he hopes the full Congress will pass the National Quantum Initiative Act before the end of this year. In the meantime, many unknowns remain, including the question of how best to begin to train the next-generation workforce that will confront the technological challenges head-on in the coming years. That’s one area where institutions such as the UO can play an important role, UO researchers say. Companies and universities aren’t sure yet what an “applied quantum scientist” actually is, Smith suggested, so part of the task ahead is to flesh out that job description and fashion new academic programs in response.